In typical Bowery Girl fashion, just as we were prepping (aka cleaning) to welcome The Big Guy’s family to our home for Christmas festivities we made a rather disturbing discovery. It happened when TBG was cleaning the upstairs shower. Them thar are some crook’d lines thar Captn’! The tiles were most definitely wonky! I thought I noticed some heaves in the wall in recent weeks, but honestly, didn’t realize how bad it was until now (and figured they had been there all along). Fearing the worst, that water was somehow getting into the bathroom from the exterior (the bathroom borders two rooflines), we slapped a happy face on each other, and proceeded to advise our overnight Boxing Day guests that we were down to one shower. Thankfully, they were too full of Sweet Potato Casserole to notice. As soon as the last family member had cleared the driveway, we immediately started the investigation. 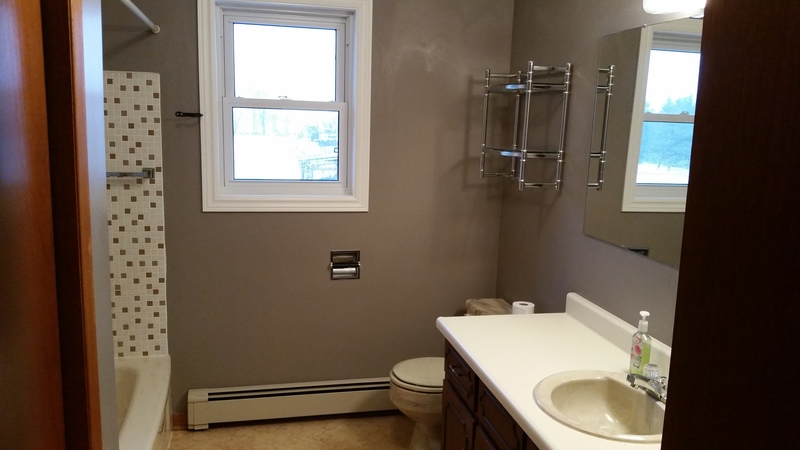 Now, before you see these photos, keep in mind that this house is more than 30 YEARS OLD and this bathroom has not been updated. To say we were due for a reno would be an understatement. Remember, you can’t un-see this!!!! The vanity doubles as a coffin…. 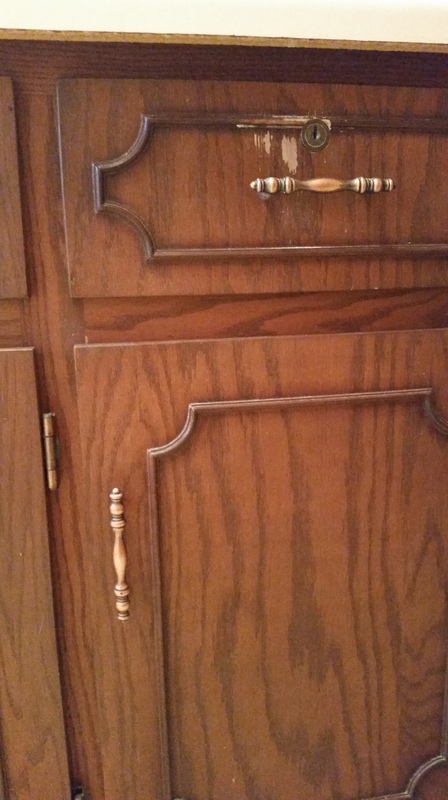 “Quality” workmanship….not…. And who in their right mind needs to lock in their toothbrush?!? 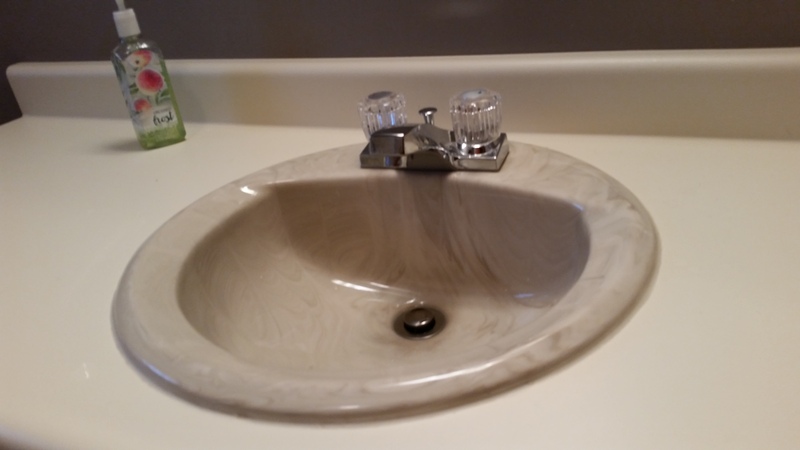 And if you like the swirly sink…. There are no words for the flooring. But on the up side, you know where to put the mat! In the 20 minutes it took me to tear down the curtains, decor, etc., TBG was grabbing tools and getting ready to cause havoc! The entire process took him less time to get down to the studs and insulation than it did for me to pack the clutter away!! 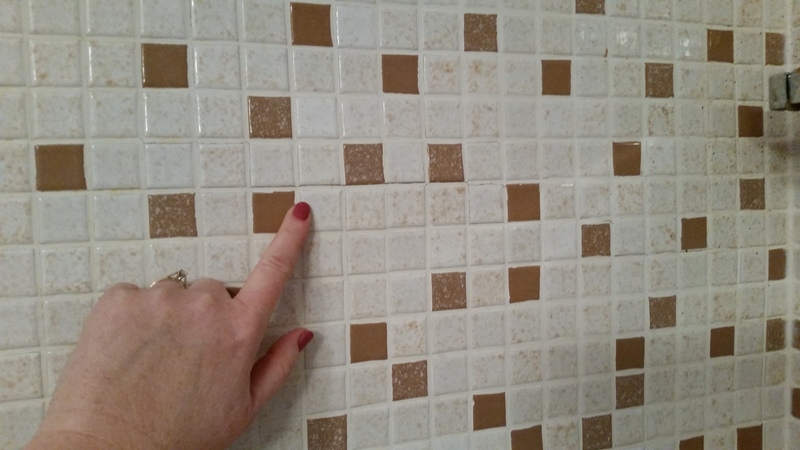 The tiles popped like Tic Tacs. In the end, the good news is, there’s no external leak. The bad news is TBG thinks he may have contributed to the water seeping through the grout with his “enthusiastic” cleaning technique and tools. 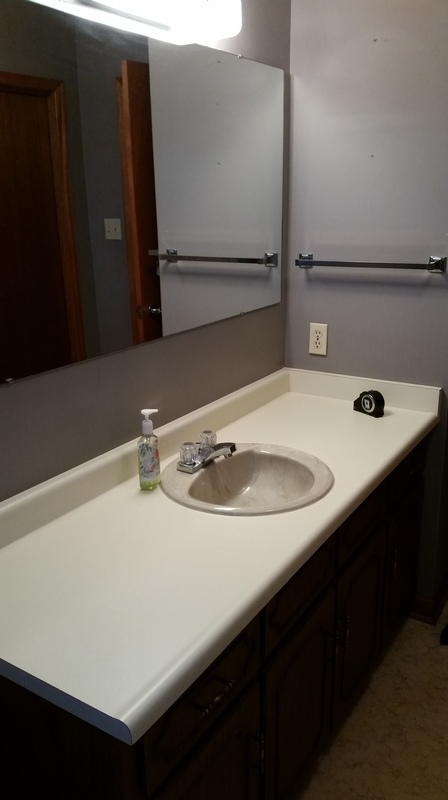 He was so upset, that he declared that the entire bathroom would have to be renovated. I, being completed stunned with this revelation and assumed I mis-heard or that he mis-spoke, stammered, “You mean we’ll get a new tub-surround”, to which I was corrected. No – he said, we would rip EVERYTHING out and start over! Who am I to argue with someone so motivated by passion. You DID look at those photos didn’t you?! I did try to ease his guilt by pointing out that the insulation proved that we needed to tackle this project before black mould consumed us all. So, actually, he did a good thing! See! I can make a positive out of ANYTHING! This project quickly dominated the Christmas holidays. My original plan was no plan at all, outside of wearing PJs 24/7 and limiting my social interaction to one trip to the “City” to see the latest Star Wars instalment. This was quickly scrapped when it became obvious that we needed to spend quality commerce time in our local hardware and big box stores. And folks, I can tell you, it has been an education. Every time we asked to look at showers, we were shuffled in front of displays of glass, retina-frying chrome and a quarry worth of tile. Showers have become somewhat of a spectator sport, complete with clear glass, rain shower heads, and, if you’re lucky, a surplus of water jets at various levels that basically sandblast your undercarriage. This kind of luxury is lost on me. TBG has got himself a basic kinda gal. I think I disappointed a couple of sales reps when I didn’t squeal like a redneck at NASCAR. LEARNING POINT #2 What you gain in water conservation you lose in costly plumber labor. 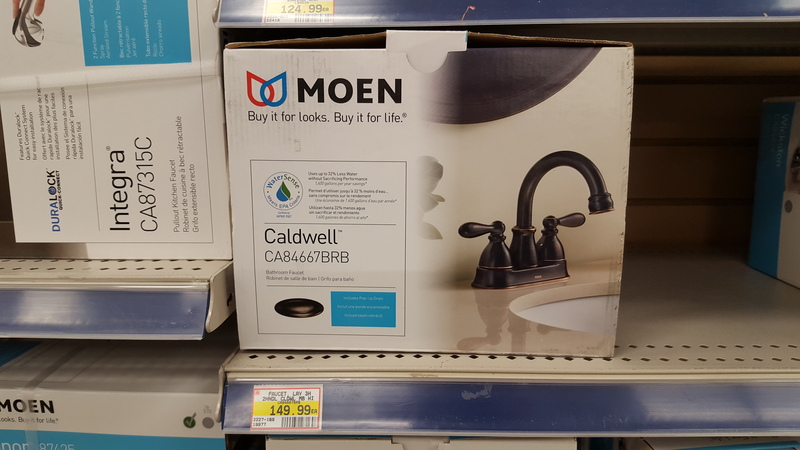 I do make every effort to consider environmental impact whenever I can, so I was very disappointed to learn that most sales reps are steering customers away from the “dual flush” toilets. You know, the one that has two flush options: a trickle for a #1 and a torrent for #2? Apparently users find these toilets confusing and either a) use the full flush for little tasks thereby negating the efficiency, or b) clog the toilet because you didn’t use the “big” flush for the your “big” job! Time to call the plumber! LEARNING POINT #3 Yes Virginia, there IS a difference in toilets! What can I say, I was sadly ignorant in my toilet knowledge. 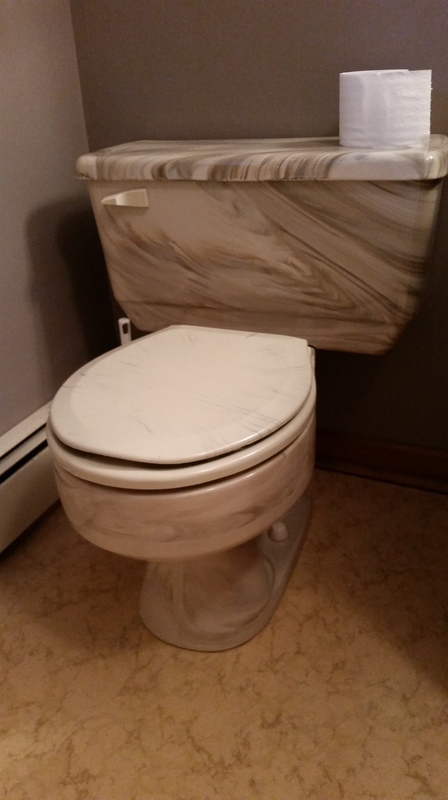 When a sales rep told me she had a “favourite” toilet, I couldn’t help but scoff. Literally. I laughed at her. Then she walked me in front of this beauty, and I apologized profusely. Firstly, the base of the toilet curves up toward the tank so there is no nasty place where guck can party; just a nice smooth area that wipes easily. 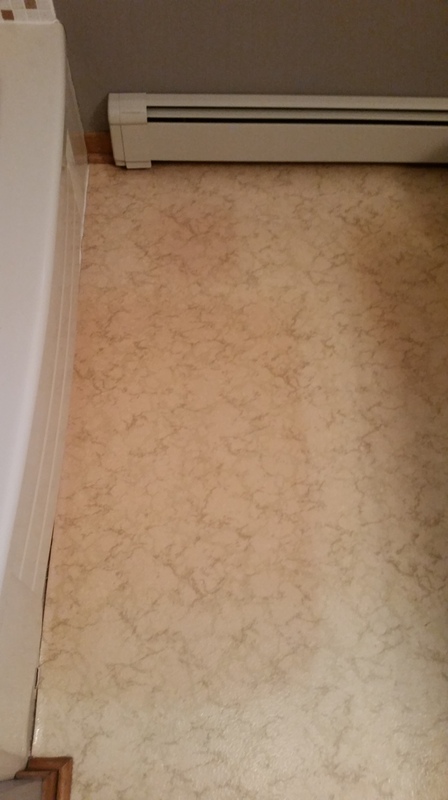 Secondly, LOOK AT THE BASE OF THE TOILET! No weird roller coaster of pipes and capped screws, simply a smooth vertical wall. That means no nasty areas where funky stuff gathers. (You mothers of sons know of which I speak!!!) Let’s face it, you have to wipe the floor around the toilet anyway, but with this model, the clean up is fast and simple!! The lip of the lid is oversized to cover the seat down to the bowl, again, eliminating the amount of dust that accumulates on the horizontal surfaces. Finally, the lid has a soft closing mechanism. No more slamming seats and lids in the middle of the night! I’M. IN. LOVE. LEARNING POINT #4 I need to find out how to sell a kidney to afford this toilet. While my tastes are not extravagant, when I find something I like, I have a hard time “settling”. It’s too bad we don’t pay blood donors in Canada…..
LEARNING POINT #5 Everything old is new again! TBG is crushing hard on oil rubbed copper finishes for the faucets etc. Not sure I can stomach it, but we’ll see. If he’ll agree to the toilet, I’ll concede on the old-timey taps! LEARNING POINT #6 All “deals” are not equal! TBG and I got excited when we were told that we’d benefit from sale pricing at a couple of locations, however, our thrill was quickly tempered but the realization that one man’s “deal” is another man’s pocket change. LEARNING POINT #7 It’s time to get creative. Maybe it’s too much HGTV, but I have found it very interesting to see what happens after I tell a sales rep “that’s not in my budget”. I don’t think for a minute every costumer jumps at the first suggestion, but I have been encouraged to see that some of the people we have been working with have been very helpful and come up with some great ideas for those of us who don’t have the billfold for a hotel-calibre salle de bain. It gives a girl hope! And at present, the project awaits some serious decision making on our end. Specifically, which son do we sell to afford this, and how much more could we make if we throw in the dogs? ?